A pull-out screen that doubles in size for your phone. 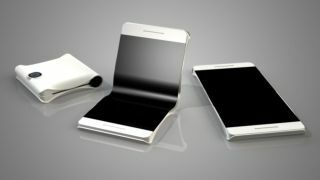 The promise of bending, folding, flexible smartphones is yet to be fully realized, but a new patent from Microsoft gives us fresh hope of exciting form factors in the future. The patent application for a 'flexible display extendable assembly' was originally filed way back in January 2016, but it's only come to light now after being published by the U.S. Patent and Trademark Office, and getting spotted by WindowsLatest. Sketches included in the filing show a flexible screen that slides into the body of a device, keep just half of it on show, with the ability to pull the whole screen out and effectively doubling the size of the display. Great for gaming and Netflix? The patent says that the technology could be used in a variety of portable electronic devices including mobile phones and tablets. It goes on to say: "a mobile phone with a flexible display can be used as a standard-size phone and then also extended or unfolded to increase the display viewing surface for a user to read emails, view a map, edit a document and other tasks that are conveniently accomplished on a larger display." This all sounds very exciting - we'd love to be able to extend our phone screen during the daily commute for video streaming and gaming - but the likelihood of seeing this technology on devices anytime soon is low.